On 8/2011 I wrote: I have been waiting to make this Curried Okra for some time now. But every time I went to the grocery store the fresh okra didn't look it's best. The other day I came by a good bunch so I quickly bought some. Most people (if they don't already love okra) are turned off by how okra can be "slimy". I will teach you an easy way to avoid this from happening and maybe even convert some non-okra fans in the process. Heat 1Tbs of canola oil in a large skillet on medium-high heat. 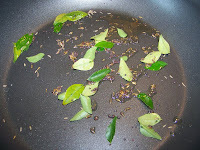 Once heated, add your cumin seeds, mustard seeds, curry leaves and cinnamon stick. Fry until fragrant (about 30-45 seconds). 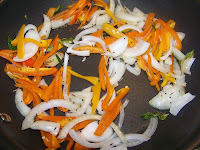 Next add your onions, peppers, garlic, some salt and saute for another 1-2 minutes. 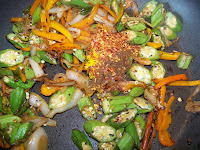 Add your okra next and saute for 7-8 minutes. 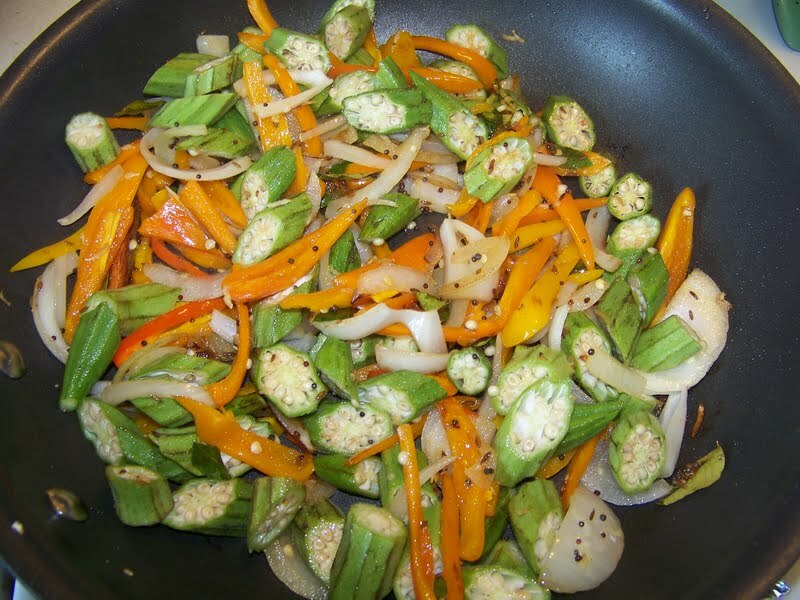 Cook until the okra is almost cooked to your desired tenderness. 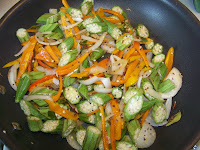 Stir occasionally, but avoid stirring too vigorously so the okra does not get slimy. Finally add the dry spices and fry for another 2 minutes. Taste for salt and seasoning. 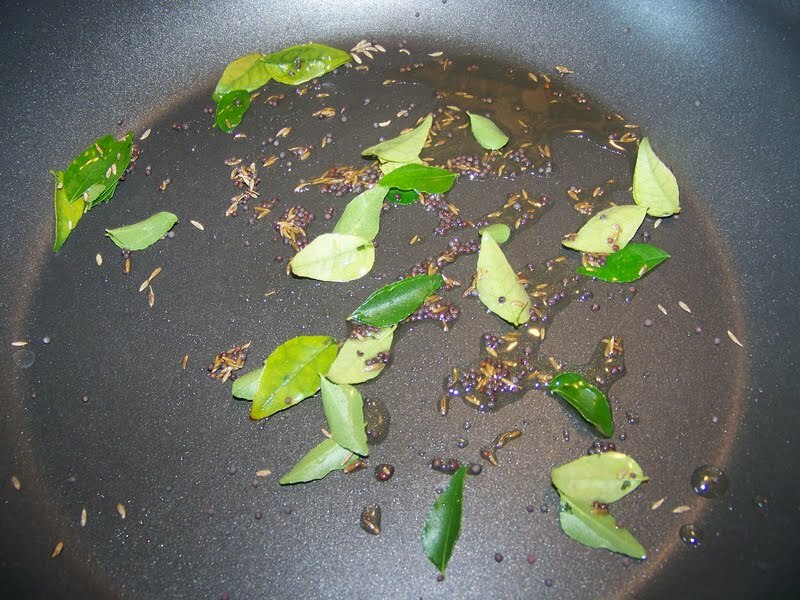 I added a splash of lime juice (about 1 tsp) to give a little fresh finish. The dish is done now and can be enjoyed. Oh - this is fabulous! 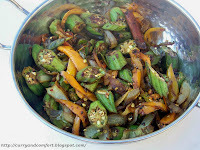 I'm the same way - I don't like slimy okra, but there are ways to make it crispy and crunchy...this looks delicious! I'm one of the slimy haters, but yours doesn't look slimy at all. 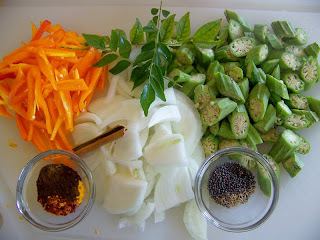 If I see any nice looking okra I'm definitely trying it again!! Such any interesting recipe. I love okra, but always forget to cook with it. Definitely need to give this recipe a try! Love the spices! 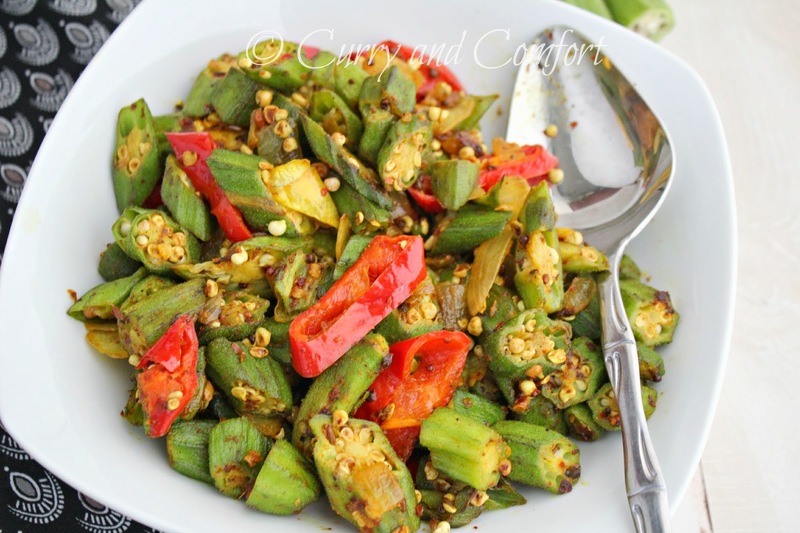 Not a fan of okra... but I'd love to make this with asparagus perhaps! Great use of spices with this! I went to a indian restaurant and had some wonderfully crunchy and not at all slimy okra and I loved it! 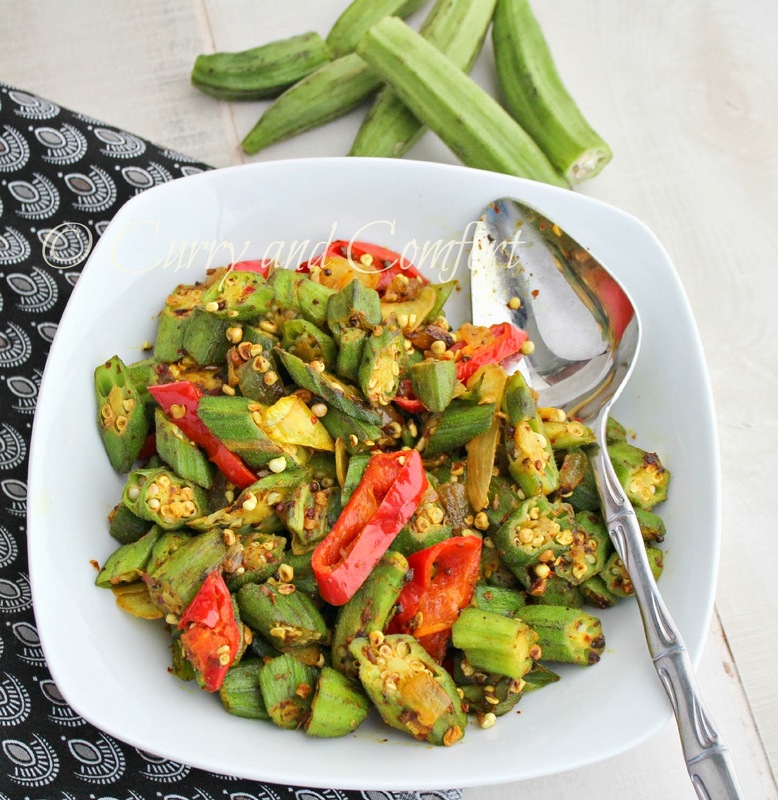 Thank you for revealing the secret to perfect okra: will have to give it a try! 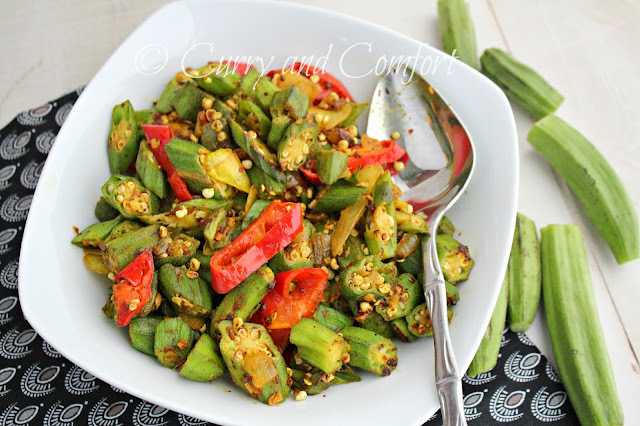 I have never had Okra - I want to try it though and since I love spice this would probably be a great fit for me! Thanks! You even know how to make okra look good! The drying tip is new to me. We add anything sour to make the slim go, such as a dash of vinegar or lemon juice and that does the trick. 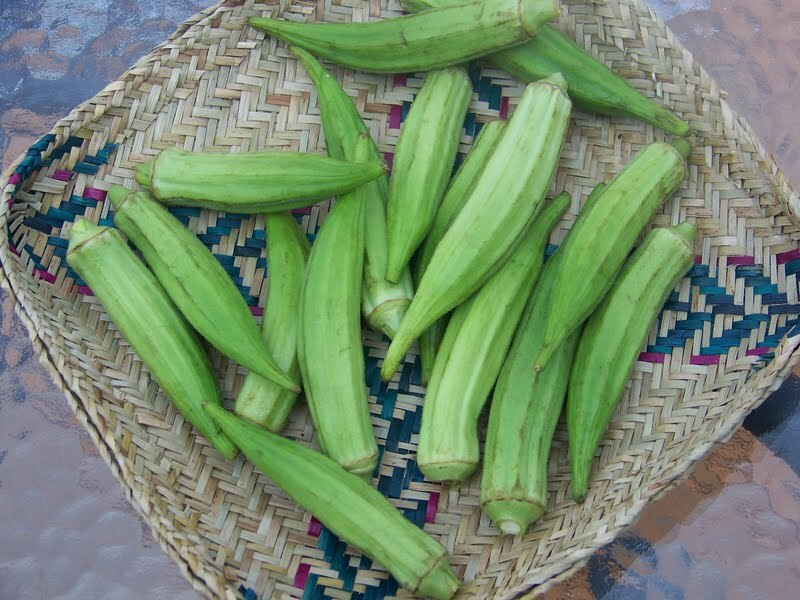 People here don't call it okra too but ladyfinger which was so confusing for me at the beginning. Love okra otherwise and your recipe is for sure a winner!